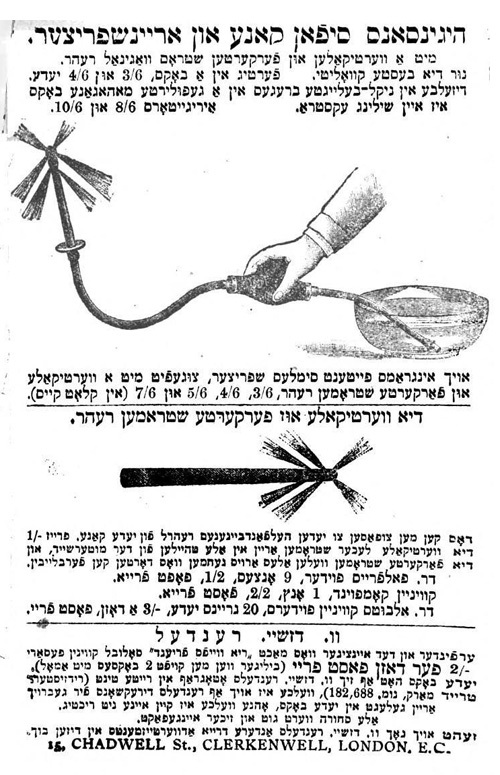 A Kol Nidrei alternative from the 1850s. Are you still thinking about Kippur? I forget to post Abraham Geiger's Kol Nidrei. Does anyone with a nice set of pipes (or even a not nice set) want to record a version of Kol Pishoai and post for us? 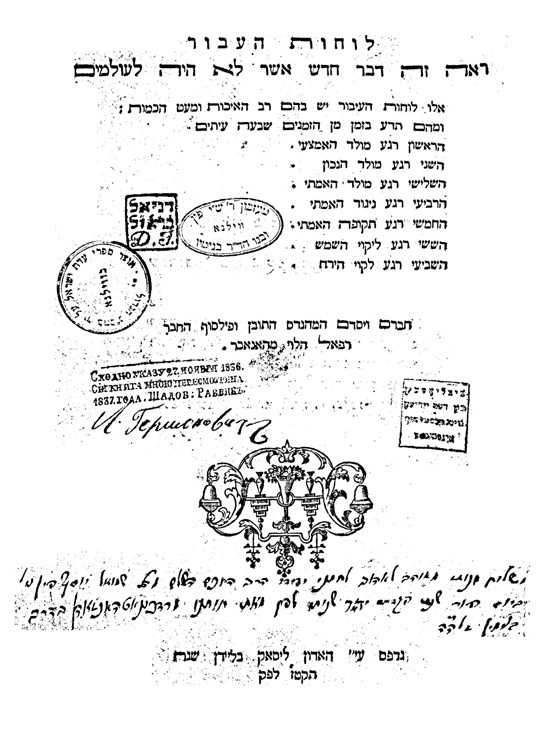 Here is a translation of the 1841 rabbinical contract given by the community of Ujhely, Hungary to Rabbi Zalman Leib Teitelbaum, (1808-1883), also known as the Yetev Lev and the grandfather of the Satmar Rav, Rabbi Joel Teitelbaum. Apparently offered this seat at the time more out of respect for his grandfather then his own qualities (he was a young men then) this contract contains some interesting clauses (see, e.g, 4, 9 and 12). 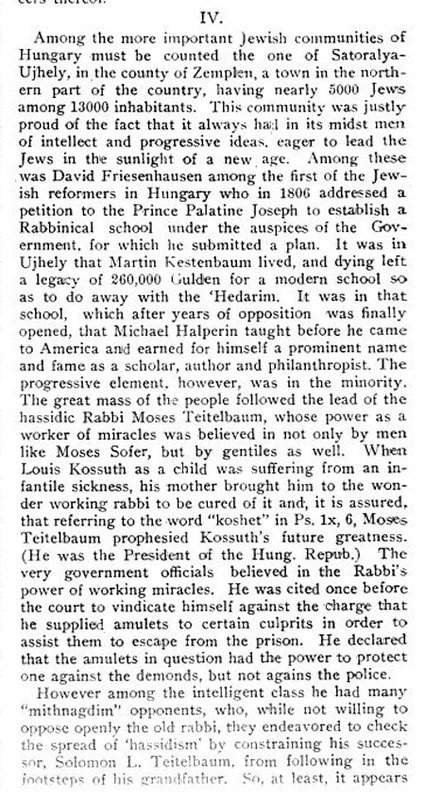 From the article Rabbones Briefe by Rabbi Julius Rapoport in the April 11, 1914 issue of The Advocate: America's Jewish Journal (link). 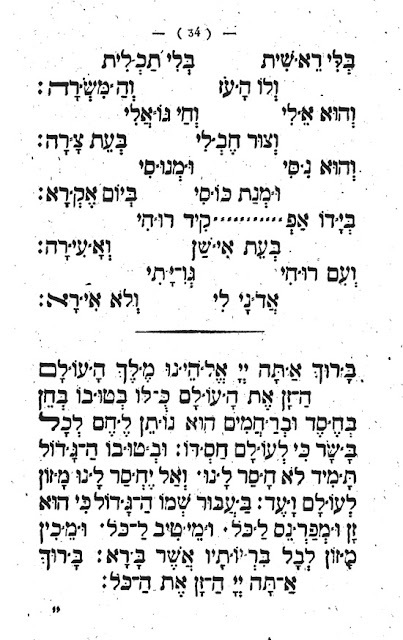 The article also included a translation of Rabbi Akiva Eger's rabbonus briefe from Posen, dated 100 years earlier. 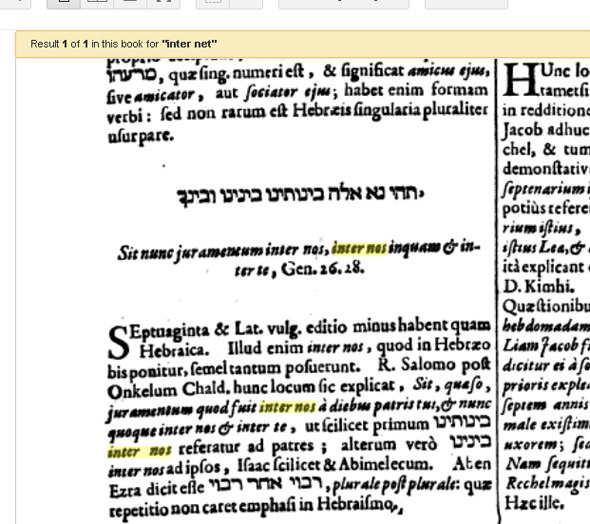 At the end of this post is the original Hebrew, as well as its source and some discussion of it. Note how loose Rapoport felt he was entitled to play with this translation, renumbering, etc. 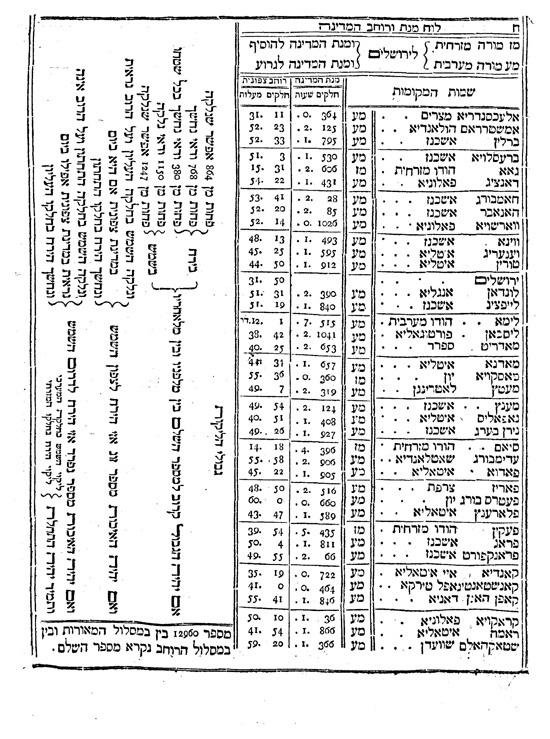 Here's an interesting page from this calendar tool, printed in Leiden in 1756, for use in calculating the molad for kiddush ha-chodesh. What I find particularly interesting are the chosen cities, from Alexandria in Egypt to London to Lima, Peru to Siam to Paris. Warsaw and Stockholm are there, but not Vilna. Also of note is that the designation Yavan "Greece" is used instead of Russia (or Rusland). 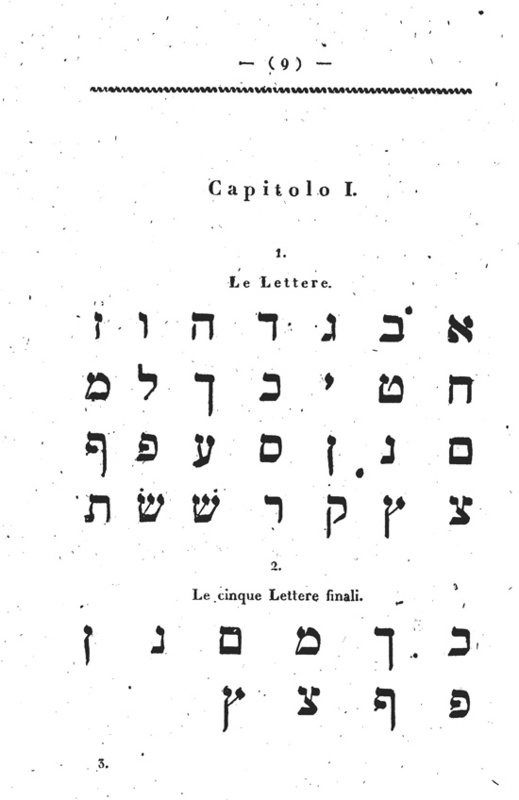 Here is the title page, which gives the author as Raphael Halevi Hanover. From the stamps you can also see that while it ended up in the YIVO Library (and made it to New York, where it was scanned by hebrewbooks.org) but prior owners included the Library of the Great Synagogue of Vilna, S. J. Fuenn - it is inscribed as a gift from his father-in-law Mordechai Nathansohn - and another stamp which is hard to read, but I think may plausibly read Daniel Jaffeh, who is otherwise known as Daniel Itzig, famous 18th century Court Jew and patron of Jewish learning; he founded the Berlin beit hamidrash frequented by the Pri Megadim, Isaac Satanow, and others. But of course I can only read "Daniel," the fact that the Latin initials are "D. J." and that it looks like the Hebrew surname is three letters, which may be yud-heh-feh. 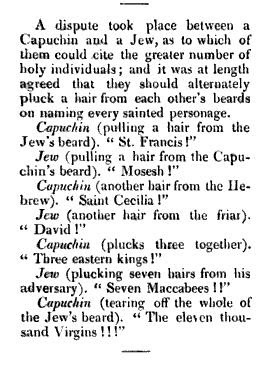 A Capuchin monk and a Jew walk into a bar; a joke from 1837. Okay, maybe there was no bar. From Fraser's Magazine. It is necessary to read about Saint Ursula. 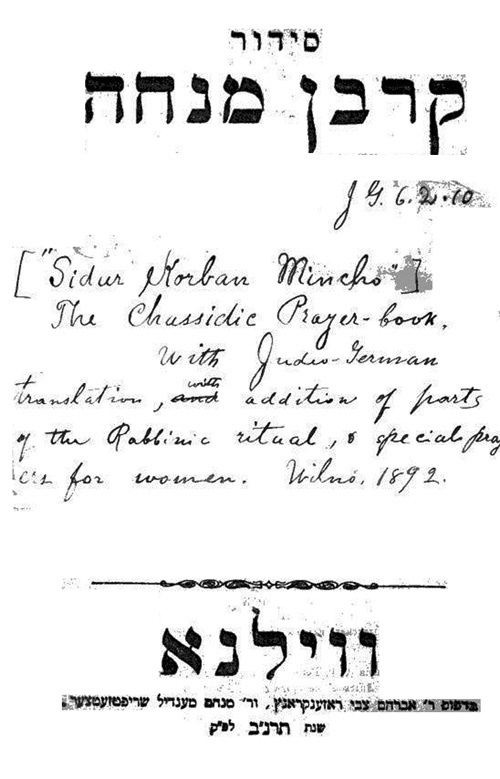 Here's an interesting entry penciled on a Google Booked Korban Mincha siddur. 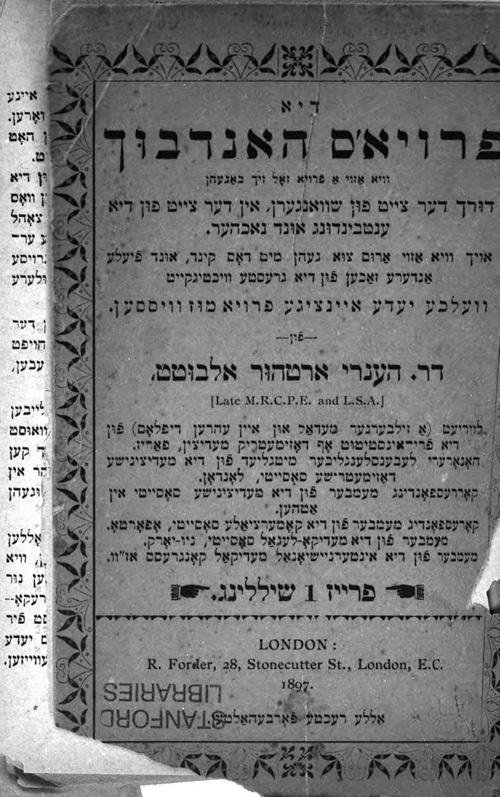 The siddur was printed in Vilna in 1892, and the entry was written in 1910. One of the great things about history, bibliography, bibliolatry, is that eventually the describers become interesting in their own right. 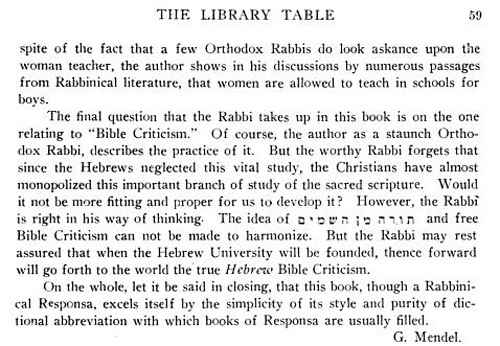 So if you want to know what a Korban Mincha siddur was perceived as by a Harvard librarian in 1910, here it is. Now, I know some will say "Well, that's what it is." But my point is that 100 years later it isn't really thought of as "a Chasidic prayerbook" per se, but as a woman's prayer book. And that is why Artscroll calls its women's siddur Korban Mincha in Hebrew (link). Apparently so - these are representative questions which Rabbi Henry Pereira-Mendes included in his series called Orthodox Judaism - The Future in the section titled A Plan for Organization in the Jewish Forum. As you can see, he advocated for the formation of a national bet din to deal with modern questions and to publish answers to them. These are the questions which "every modern Rabbi knows" (because they get asked them). Here's an ad promising a reward for the recovery of a stolen wig worth £3 which, according to my crude calculations, is over $600 today. From the New State of Europe January 20, 1702. 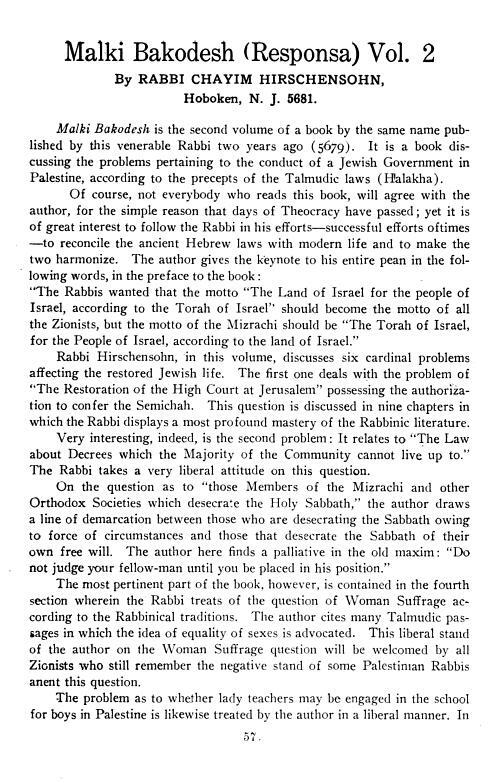 From the Jewish Forum January/ Tebeth 1922. 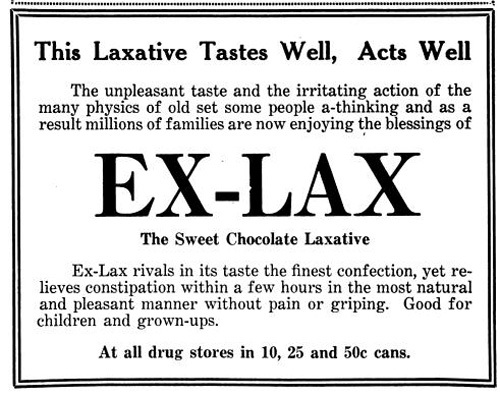 I cannot resist adding the advertisement for Ex Lax that was sandwiched between these two pages. Here is the book in question. 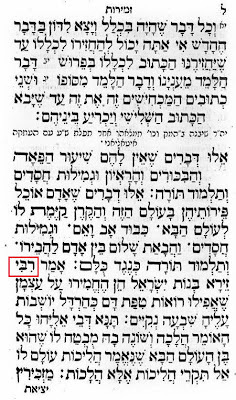 I'm guessing this is the first time the Chasam Sofer's ruling on metzitzah was publicized in English. 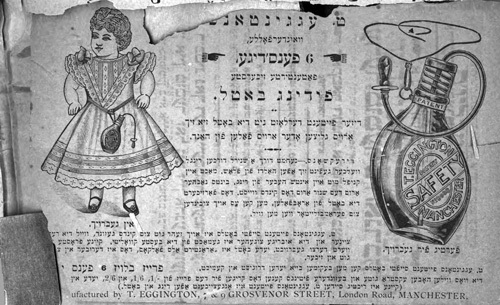 From the Jewish Chronicle June 4, 1858. 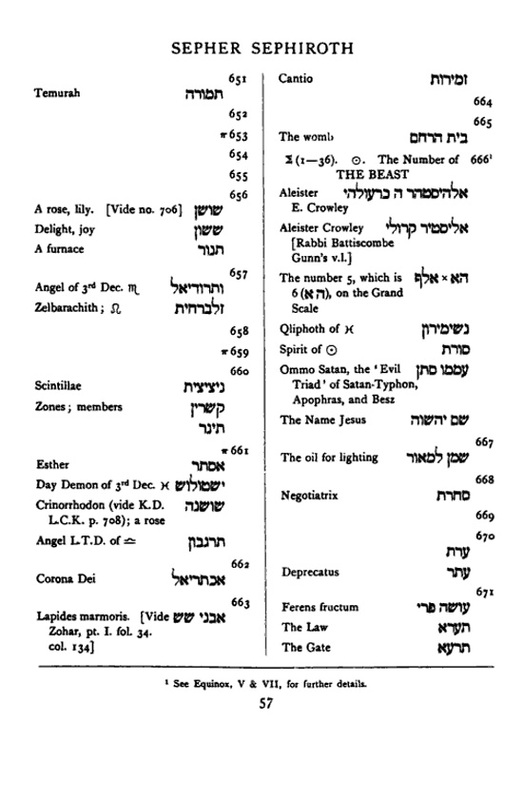 Here's a page from Aleister Crowley's Sepher Sephiroth, probably the only Hebrew/Aramaic dictionary ordered by gematriya. Here is Martin Buber's dedication of his Die Geschichten des Rabbi Nachman (Frankfurt A.M., 1906), to his beloved grandfather Salomon Buber, who died that same year, no doubt because his grandson wrote this book. 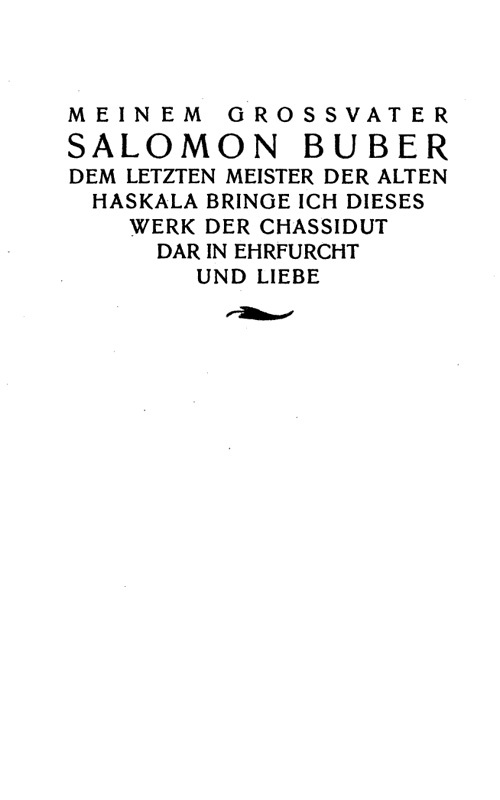 The dedication is to "To my grandfather Salomon Buber, the last of the Masters of the Old Haskalah, I bring this work on Chassidut, with awe and love." "To save the lives and preserve the health of thousands of women, to rescue from death and disease children who may be born, to teach the young wife how to order her health during the most important period of her life, to remove from her mind the popular ignorance in which she may have been reared, and to enable her to learn truths concerning her duties as wife and mother, I have thought fit to write this little work." There are times in the life of almost every woman who bears children at all rapidly, when the knowledge of how to prevent conception will come to her as a great blessing. It is, therefore, a subject on which every wife needs good and practical advice. Many persons maintain that the course of nature should never be interfered with, and that a woman should have as many children as nature will allow. That, however, is an opinion which is rapidly giving way to one far more humane and sensible in every way. It is quite true that some women can have as many children as nature will allow, and suffer but little in health. On the other hand, it is frequently the case when a woman gives birth to children in rapid succession, that her constitution gets weaker and weaker with each confinement, and in some cases, to continue as nature allows, means an early death to the mother, and the bringing into the world of children with weak and debilitated constitutions. Is it not, then, far more humane and better in every way for a mother to give birth to a less number of strong, healthy children, who are capable of passing through life in a satisfactory manner, and at the same time, to retain her natural health and strength, rather than have a larger number of children, some of which are poor, weakly little mites, who frequently die at an early age; and the mother, at the same time, gets prematurely old and careworn? The knowledge of how to prevent conception in a perfectly harmless and moral manner is, therefore, of the greatest value to every wife. It is a subject to which many eminent physicians have devoted considerable attention, with the result that there are now a number of methods that do not transgress the most delicate moral principles, and are perfectly harmless, simple, and absolutely reliable. Quoted from pp. 65 - 66 in The wife's guide & friend: being plain and practical advice to women on the management of themselves during pregnancy and confinement, and on other matters of importance that should be known by ever wife and mother by Stewart Warren (link). And here is another bottle, which is a matone fir mutters! - another Eggington bottle. 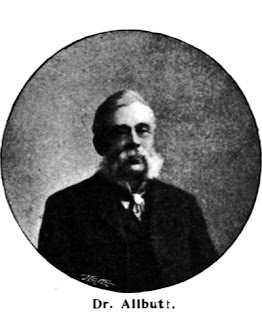 "in the opinion of the council Mr. Henry Allbutt has committed the offence charged against him—that is to say, of having published and publicly caused to be sold a work entitled The Wife's Handbook, in London and elsewhere, and at so low a price as to bring the work within reach of the youth of both sexes, to the detriment of public morals. That the offence is, in the opinion of the council, infamous conduct in a professional respect." And his name was stricken from the council's registry. Clearly he did not care, for he continued to print more editions of the book, to which we now return. Here is an ad for Rendell's aptly named "Wife's Friend," namely an occlusive pessary with spermicide, which I gather is similar to a modern diaphragm contraceptive. 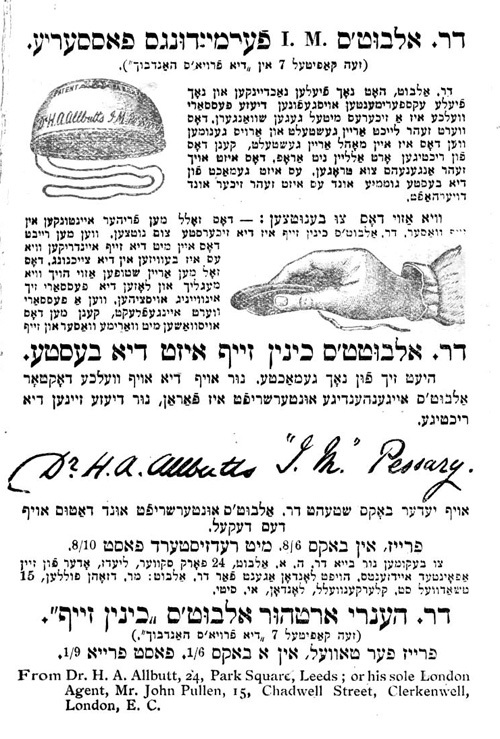 And here is Allbutt's own pessary - imagine, he even allowed his competition to be promoted! It's not that he was such a tzadik - although maybe he was - he was a committed Malthusian. 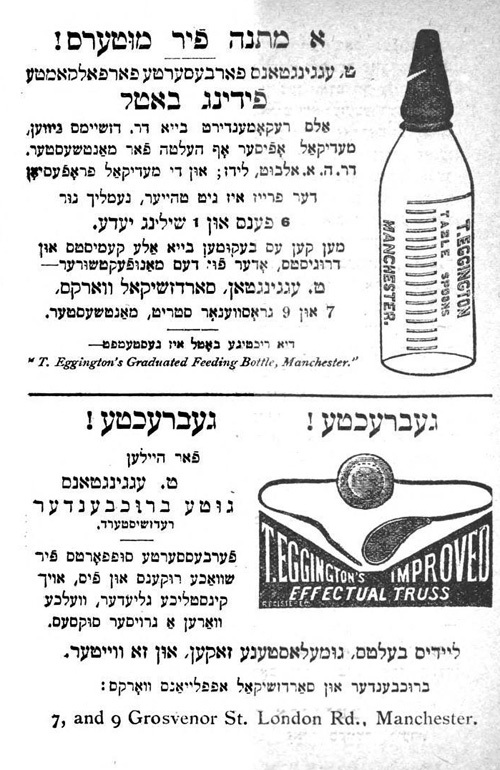 Finally, here is an advertisement for Higginson's siphon can and schpritzer, a uterine douche. Beneath it seems to be one of those chimney sweep things you see in Mary Poppins. Here's the title page from an interesting, I'm sure, book from 1899. As you can see, the author Aaron H. Frankel was a vegetarian. 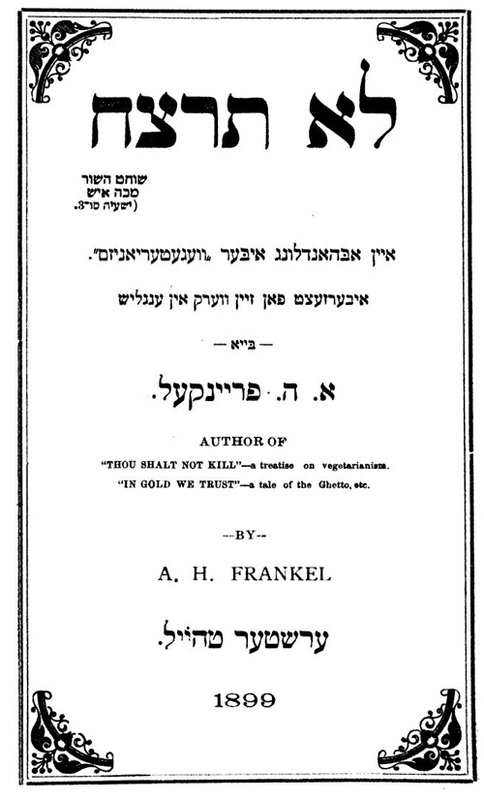 This is the Yiddish translation of the book, which in English was called "Thou Shalt Not Kill" and subtitled "The Thorah of Vegetarianism," the author includes newspaper blurbs about one of his other books. One of them, from the Boston Globe, reads "It is a bright, breezy story. The author has improved the opportunity to say a good word for his favorite dogma — vegetarianism." 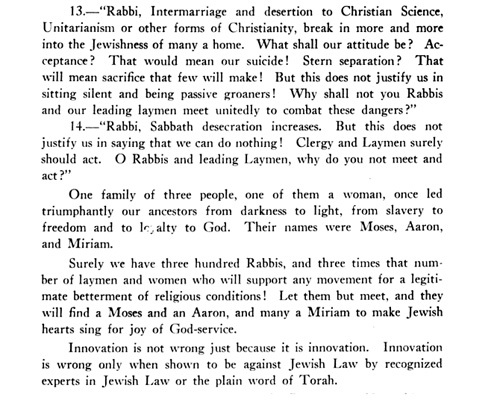 From Narrative of a Mission of Inquiry to the Jews from the Church of Scotland in 1839. 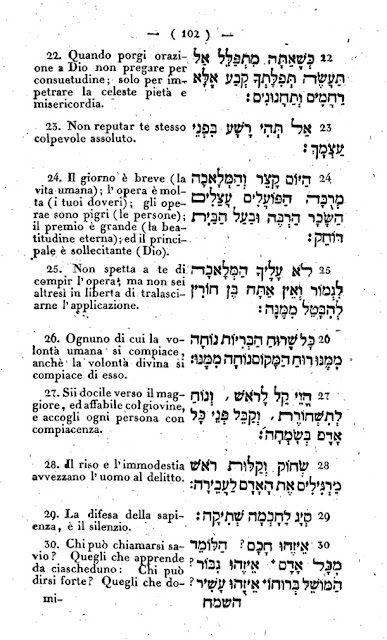 The Italian Jews particularly enjoyed the genre of chidos, enigmas, and the author (R. Immanuel Hai Ricchi [1688-1743], Aderet Eliyahu, Livorno 1742) included a few at the end of this, mainly halachic, work. The riddle describes a thing "that can burn aflame in water, all the sinners do it in secret" and so on. The answer is - AMOR. Love. 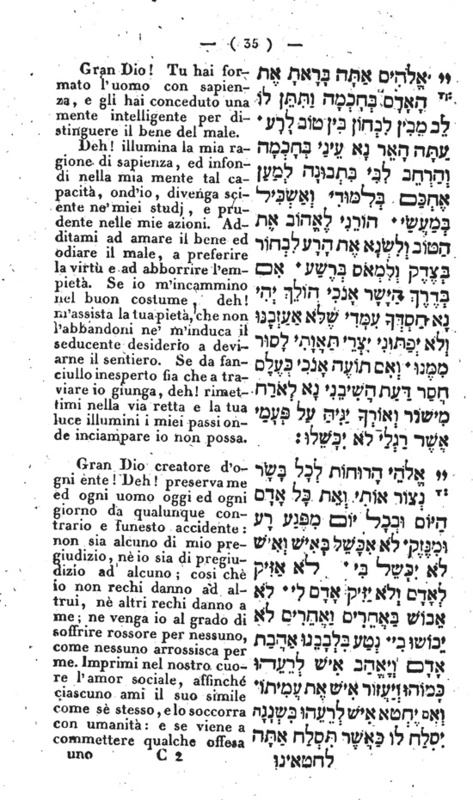 Ricchi has a good time punning on "Amor" and המור, as in הר המור, a mount of spices, because both words sound alike (the Italian Jews, being Italian, did not pronounce the ה). 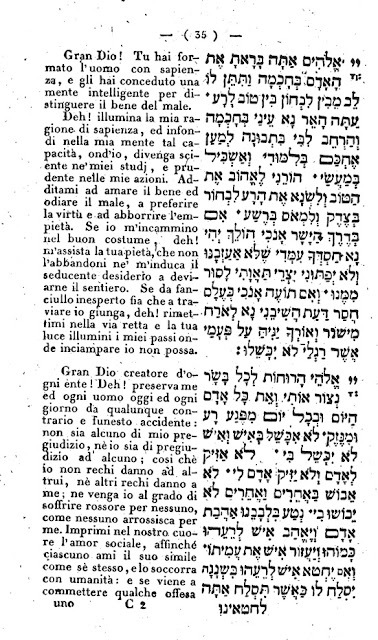 Ricchi even helpfully explains that one must not wonder at this Romance word being used to explain Hebrew, for the Torah was given in four languages - Hebrew, Arabic, Aramaic, and Latin - according to the Sifre. The full line reads "He does not do this, who feareth the Lord. He is on a Mountain of Myrrh, and not a Mountain of Rupture." (That was my attempt to preserve the rhyme. His point is that har hamor, indicates amor, love, while har bater, indicates the opposite of love). 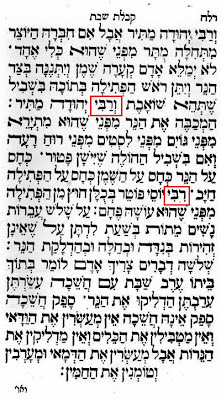 As you can see, for some reason some of the rabbis are ribbi, with a chirik, and some rabbi, with a patach, and in the same section. Why? Careless editing? 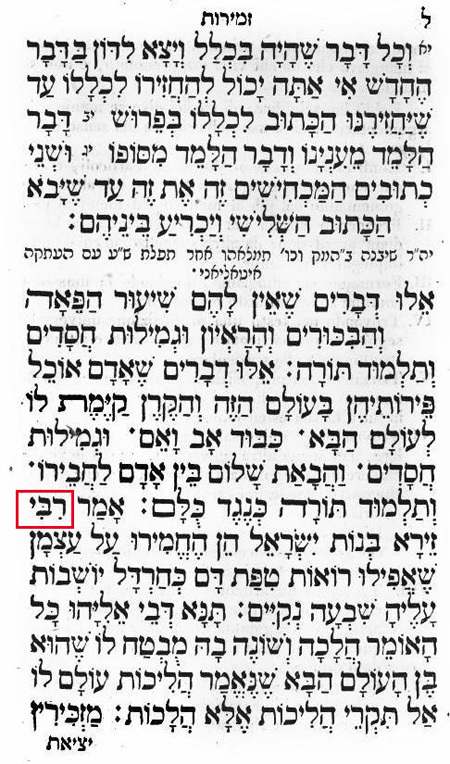 I wonder if Shadal was responsible for this pointing, and if so, he must have had his own chiddush in mind about the proper way of pointing רבי, as I quoted in this post. The traditional pointing was generally with a chirik and never with a patach. Some grammarians were able to adduce evidence for chirik, but the reasons for a patach were always etymological, and could never be deduced from early sources. Apart, I might add, from the Greek of the New Testament, where the word rabbi is spelled with an alpha. However, in the 18th century Isaac Satanow argued successfully for rabbi with a patach, probably because he was followed by no less an authority than Wolf Heidenheim. It is this pointing which eventually won the battle of the nekkudot. However, Shadal adopted a middle position. 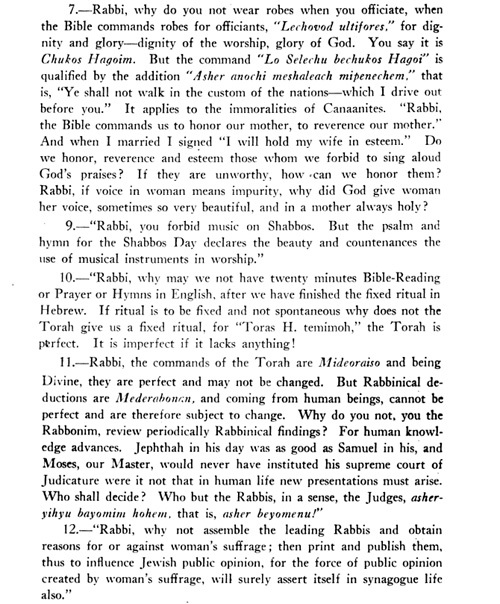 While he agreed that the textual evidence supported ribbi, he concluded that the arguments for rabbi were compelling. Therefore, he conjectured, the original pointing could have been rabbi, and it was reserved for rabbis with true ordination. However, when the term began to be used by unauthorized people, the title was modified to ribbi, and that became the mundane title for non-ordained scholars. 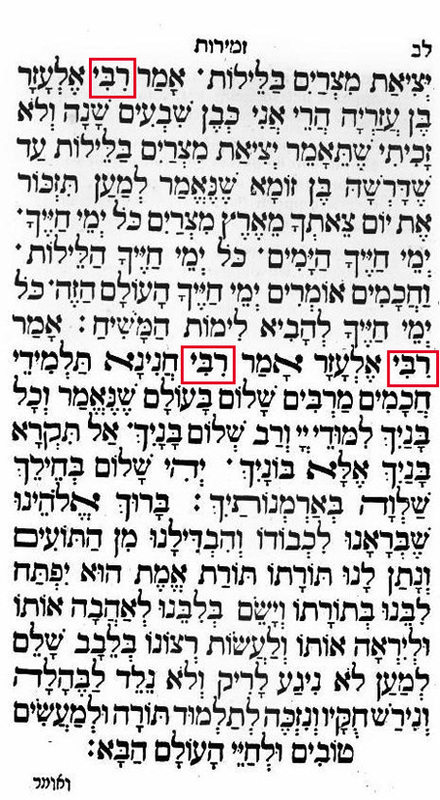 So we see here that the title of the early Tannaim are pointed rabbi, while a later one, like Rabbi Yose, is pointed ribbi. The only problem I have with this is that obviously Rabbi Elazar ben Azaryah, Rabbi Elazar and Rabbi Chanina are not later Tannaim (Rav Zeira was an amora, but he lived in Eretz Yisrael). Maybe experts in rabbinic chronology and/or who the chokrim believed were ordained and not can enlighten us. Of course it can all be one giant mistake. While looking for some early modern references to the internet, I came across some beautiful illustrations of the problems that plague OCR. 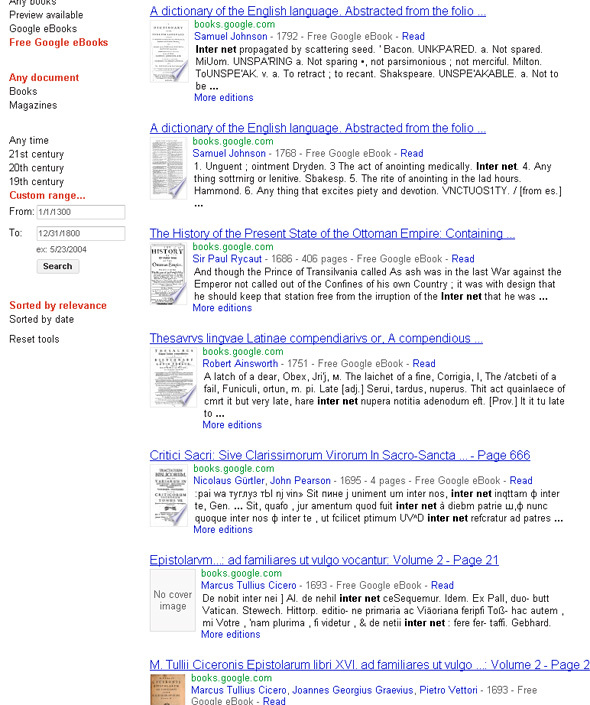 Bottom line, if search is your thing, much is still very much hidden by faulty OCR. I forgot to mention my whimsical-yet-thoughtful guest post on Oy Vey Cartoons (link). I don't do these often, so let's see what I had to say! Thanks to Shpitzle for the opportunity. 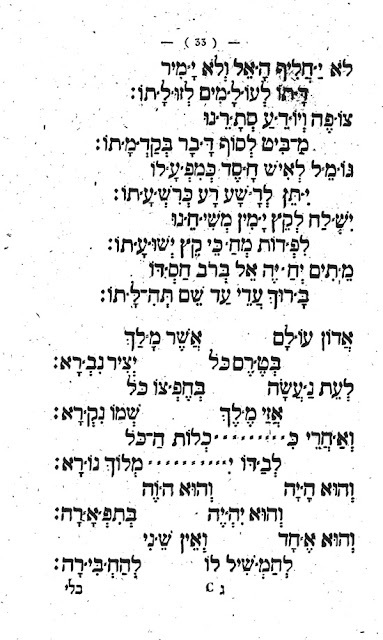 See here for Shadal's etymology of "oy vey," or at least "vey." 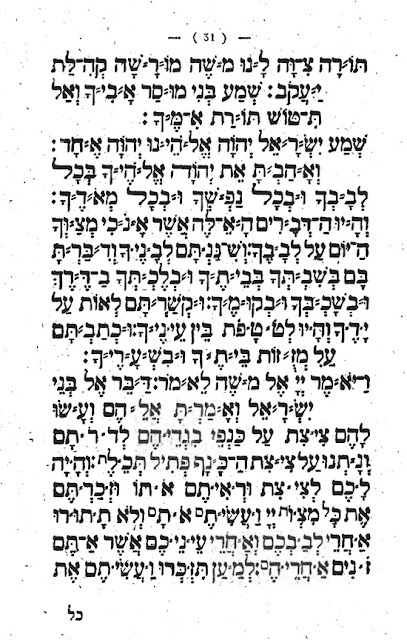 When I can't sleep, I think about Mishnah translations. Actually, translation itself, which is such an unspeakably interesting thing. Let us consider two basic approaches. One is to render the first language into the other as literally as possible. If there are 6 synonyms for a word in English, but only one term in Hebrew, then the translator will probably try to see one of them as the primary equivalent, let's say choosing "light" for "אור" rather than "luminescence." The second basic approach is to transfer meaning, but not doing so literally or slavishly. Let us suppose that in the first method a back translation into the original language is more likely to produce the original than the second. And to anticipate someone pointing this out, Maimonides favored the second method in a letter to his personal translator Ibn Tibbon. One of the things which I find interesting is that the languages evolve so that regardless of which approach a translator takes, even the more literal one, they cannot fail to produce different translations at different times. 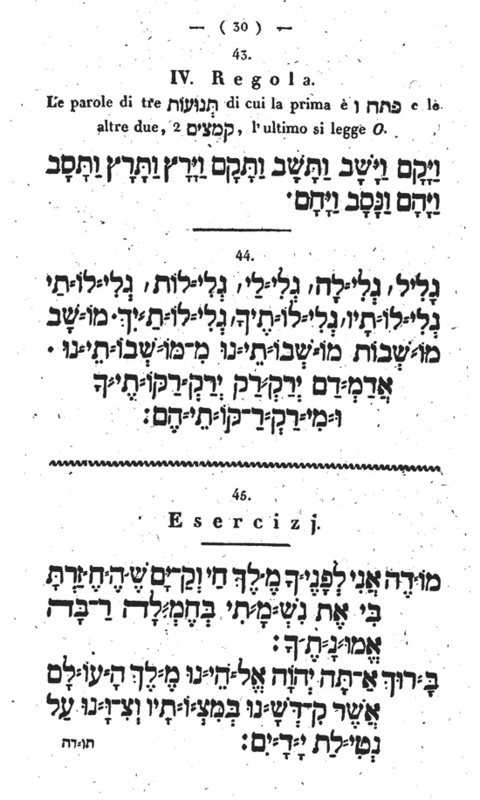 Here are some examples taken from English translations of the Mishnah, ranging from the early 18th to the late 20th century. The Mishnah I have chosen is Shabbat 6:6. 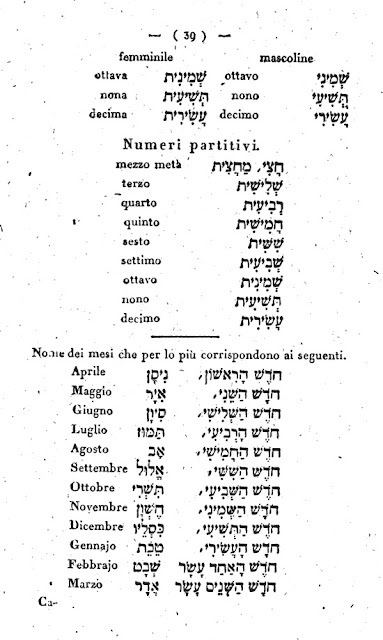 To make things easier for casual reading, I will first give only the first line of the Mishnah, with the year, and then at the end post the entire Mishnah. 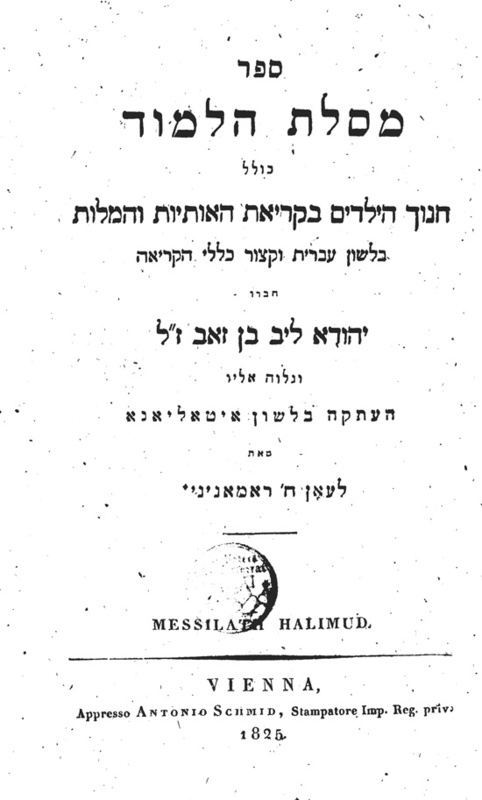 I have also included only translations taken from sources which translated entire Massekhtot, or substantial portions; I have also included sources like Rodkinson and Soncino, which are really a Talmud translation, but of course they include the Mishnah. We can see that some tried to be more literal. Literally it is in the singular, yet four chose to give it in the plural - capturing the correct meaning, but not what it says, and one of these ignored the feminine form altogether. 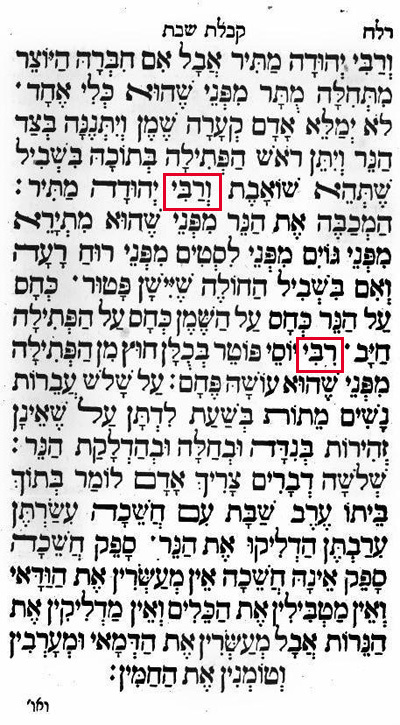 Artscroll's second attempt (in its Talmud) is literally correct that it does not say "a woman," but has no way of indicating the feminine in English, so it included this information in the bracket, and in bold, to indicate that it is in the text. 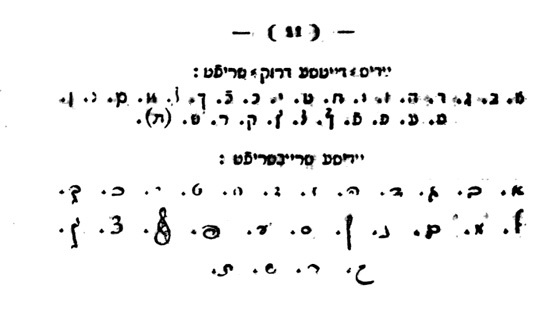 Eight chose not to translate "sela" - and all of them are in the 20th century. 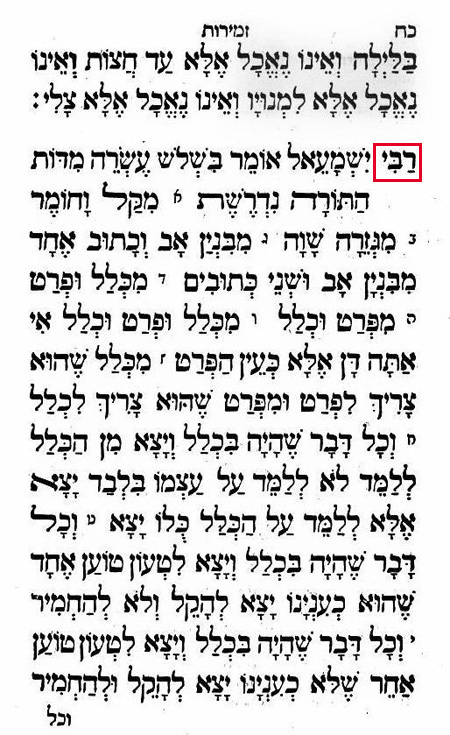 Only two did not try directly to translate צינית. 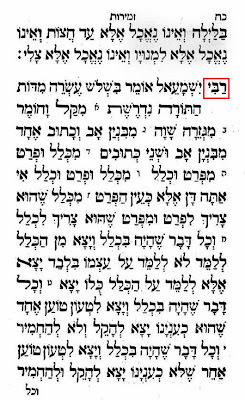 ; and as you can see, one of the times Artscroll called it a "wound [on the sole of her foot]." Many more differences and similarities as well as matters of language can be pointed out or deduced. 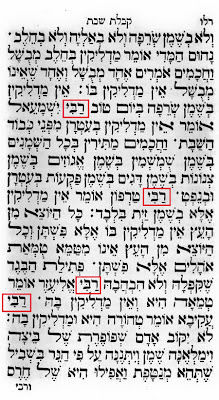 Really, the best thing is to compare them all, a Mishnah Hexapla, or to choose let us say the 7 or 8 that are not in copyright, a Septapla. I think you will agree that some way, some how, we must hear this record. Unrelated, but you can download and hear an alleged Mrs. Yetta Bronstein's version of I Want To Hold Your Hand here. 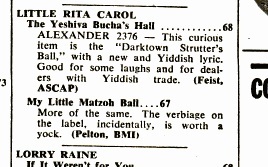 As for Little Rita Carol, although this one made it to Billboard's July 15, 1955 issue, she seems to have also had a . . . something, called He Wasn't Just an Ordinary Panhandler back in 1953 - b-side, The Cowboy With the Lasso. The mini review there says she was a kid, part of a singing sister duo. Here is a plate/ insignia/ thing for the [record book?] 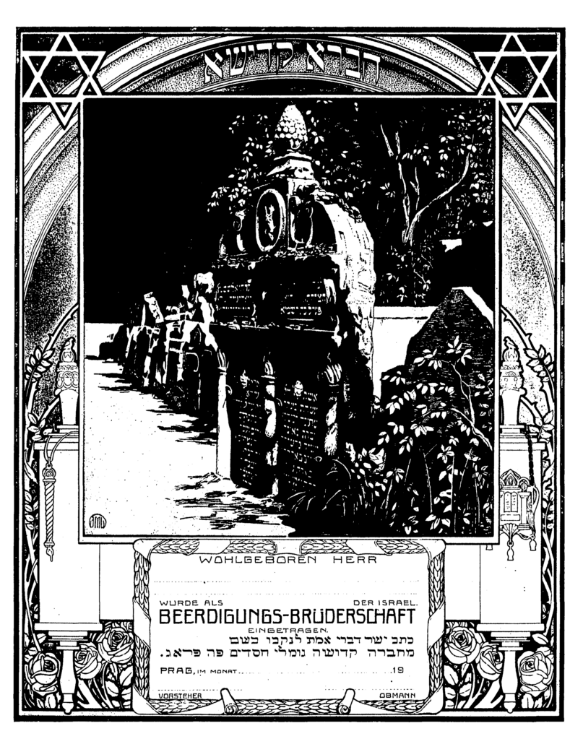 of [a, the] Prague Burial Society, featuring the Maharal's grave, designed by Lilien. Now that's classy. 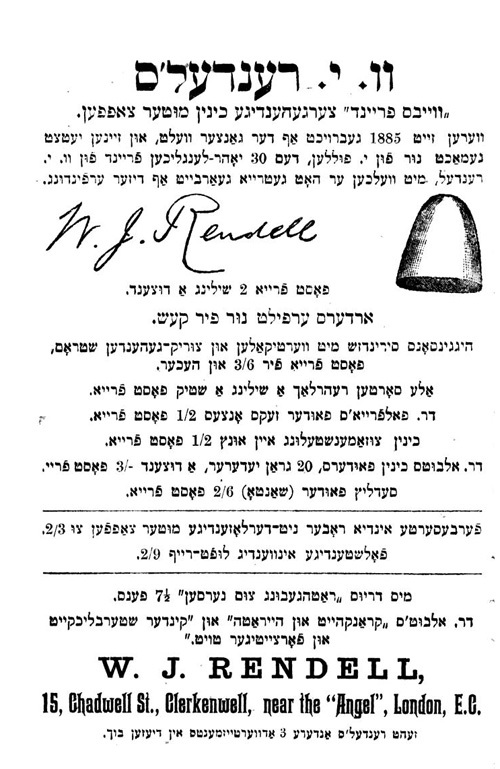 The script to a very unusual British spaghetti Western in Hebrew? Have you got a better explanation? Albeit possibly tongue in cheek. This is the era of Women's Suffrage. 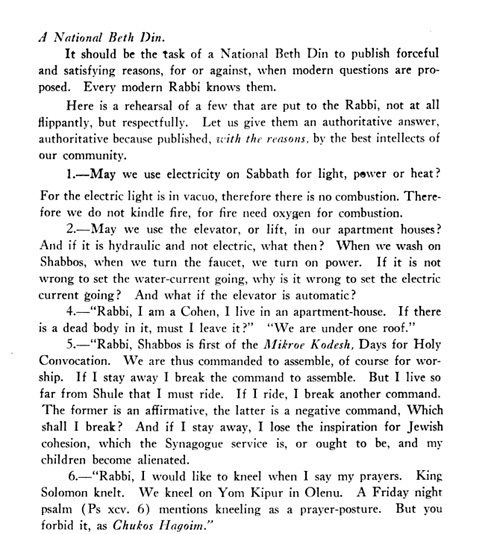 From the Advocate, February 15, 1919, in a column called In the World of Jewish Womankind, by Nannie A. Reis. See this post. Here is something interesting. Judah Leib Ben Zeev was a formidable Hebraist of the turn of the century era (the century, being the 19th). His Talmud Leshon Ivri taught generations of European Jews grammatical Hebrew. 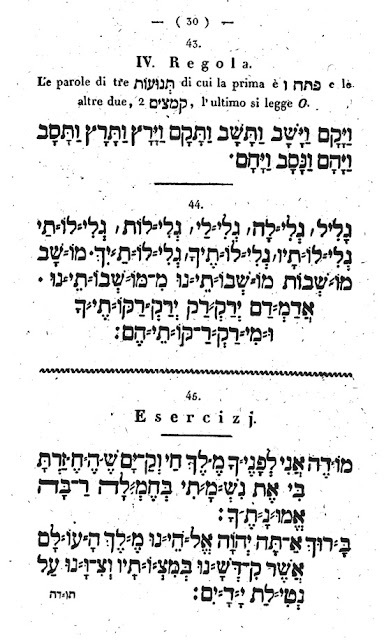 A son of one of the Central European gedolim, R. Mordechai Benet, even highlighted his father's expertise in this book in the treatise he published in eulogy for him, quoting an article in Bikure Haittim, where an anecdote about Ben Zeev and R. Banet is quoted (link). Talmud Leshon Ivri was for big boys (sadly, probably not for girls, although I'm sure more than a few picked it up and were able to learn something from it over the years) but like all good educators, Ben Zeev also had in mind the little ones. So his output was not confined to higher instructional material like TLI, and works on Bible for advanced scholars, but he also wrote catechisms for small children. One of them was called Beit Hasefer - Mesilat Halimud, in Hebrew and German (in Hebrew letters). 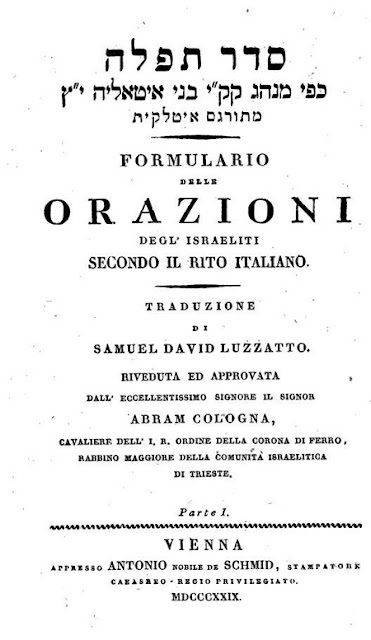 This post will concentrate on the Italian translation of this book. 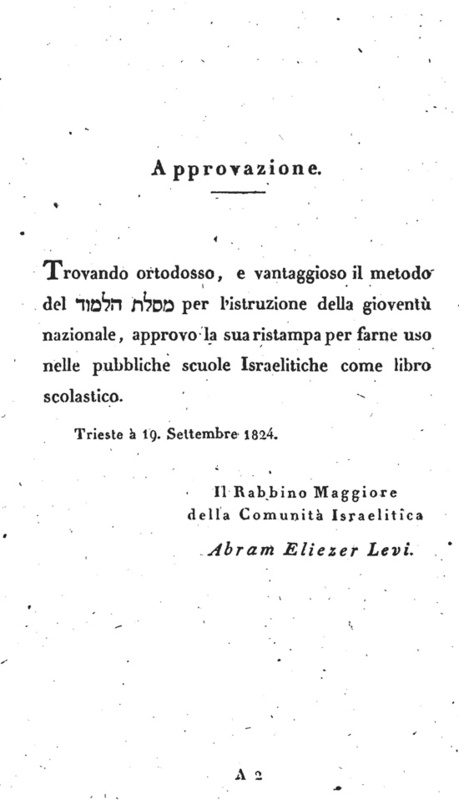 In his preface, Romanini cites the numerous editions of the book, in use in German Jewish schools, as sufficient proof of the success of its new method, which enables students to acquire a good beginner's knowledge of Hebrew in two years. He continues, it not so much for the knowledge contained in this work, although it abounds in it, but because it impresses tender minds about their sacred religion, no less than scientific and literary works. In other words, I think, this is a formidable religious textbook which can hold its own against modern European works, so important for the education of Jewish children. 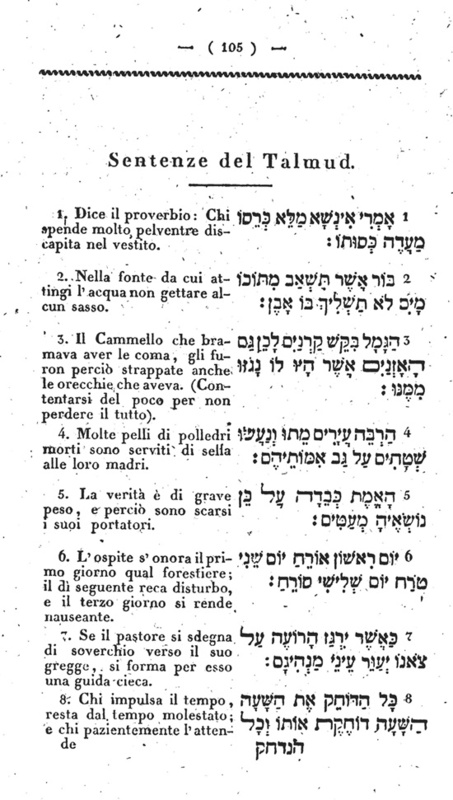 The book continues with Ben Zeev's Hebrew preface which, interestingly, is untranslated in both the German and Italian edition. I guess it was intended for the teacher. 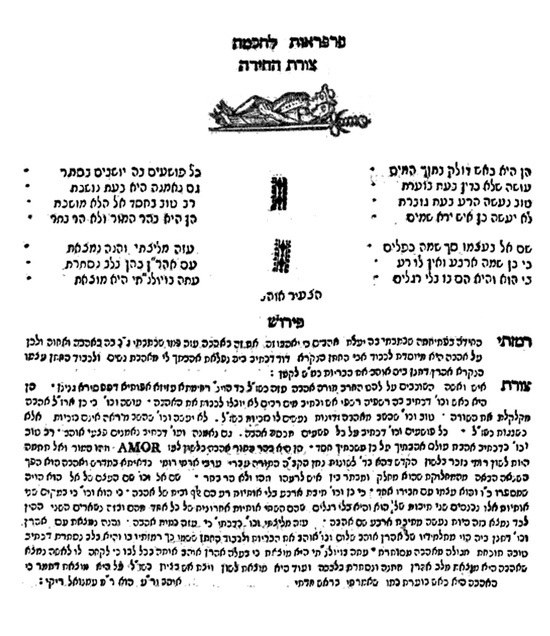 In any case, Ben Zeev writes that after investing his effort in producing Talmud Leshon Ivri and also his Otzar Hashorashim, he turns toward educating children, to teach them proper reading. 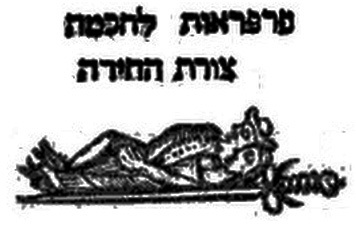 Although there is no end of books, he found that there was no good work which does this, to simply teach children how to read Hebrew properly. He writes that this is not a small matter, teaching children how to read correctly. And then he goes through the various advantages of this work. 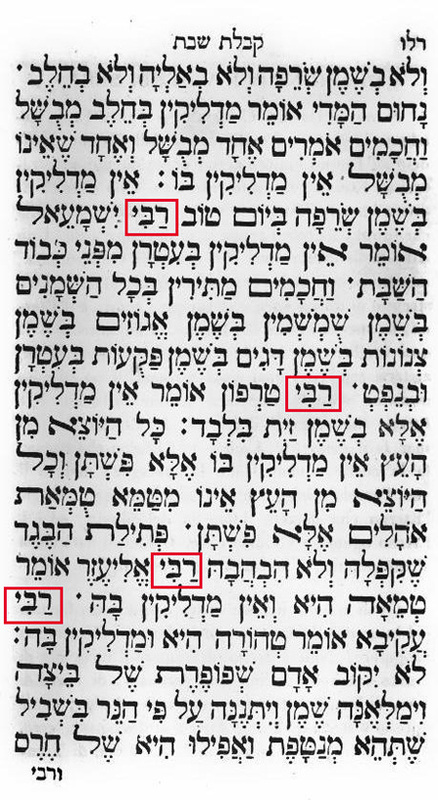 As you can see, these additional two forms of the alphabet are called by Ben Zeev the "Juedische-Deutsche Druck-Schrift," "the German-Jewish printing script," and the "Juedische Schreibschrift," "the Jewish handwriting." Following this come many pages of reading exercises illustrating all the principles of proper reading. 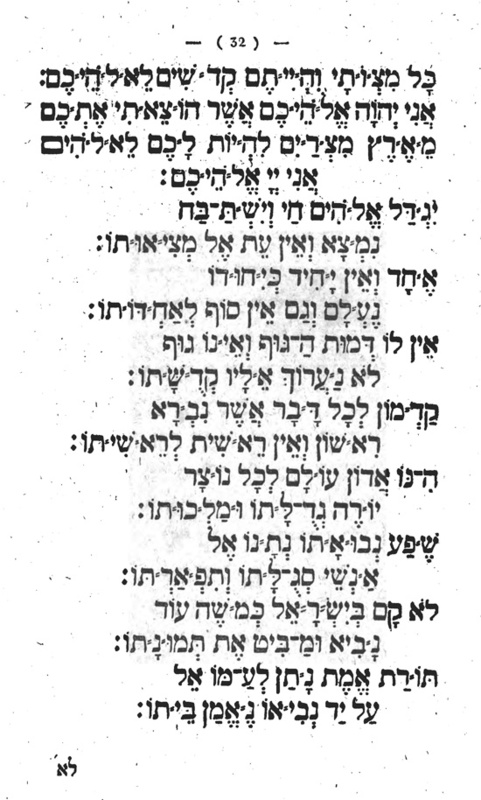 Next come some reading exercises which use proper texts, a combination of texts from the siddur, and what I think is an original Ben Zeev composition about God, religion, and acting good. Following this are lists of pronouns, and various other categories of Hebrew words, with their translation, numbers and so on. Then come various paragraphs which, I think, the pupil is supposed to be able to translate, with it broken down word by word on the bottom. They are about nature, biology, history, etc. 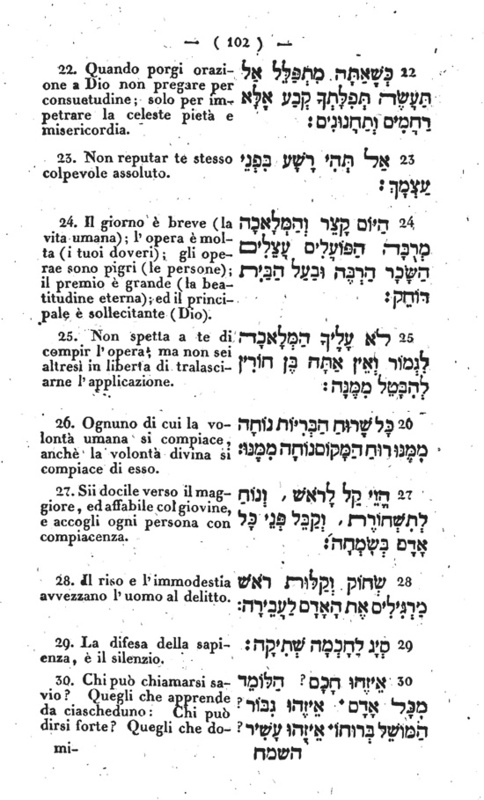 Then there are more pages of religious instruction, a section of proverbs, drawn from various sources including Ben Zeev's own translation of Ben Sira, a few pages of various beautiful extracts from Pirke Avot, and then 10 sentences from the Talmud which in all likelihood would be the first and last Talmud many of these children would ever see. 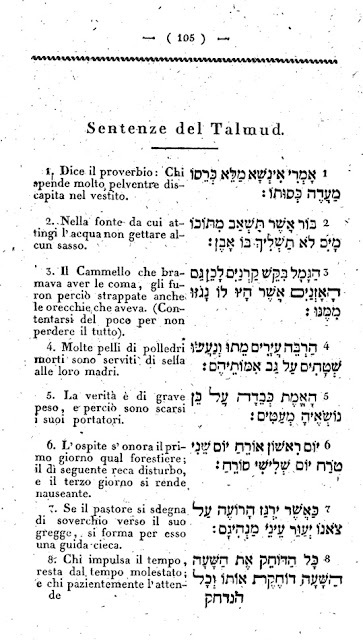 Interestingly, the Talmudic section is more expansive in the Italian version. Also, not included in the Italian is a section on Greek philosophers (all in Hebrew, of course) which is in the German version. 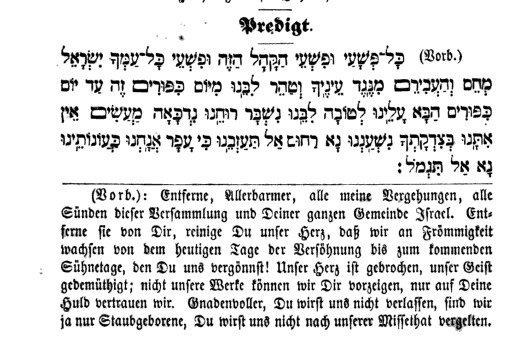 Finally, see the earlier post of mine (link) for a little bit about the 1827 edition (German). 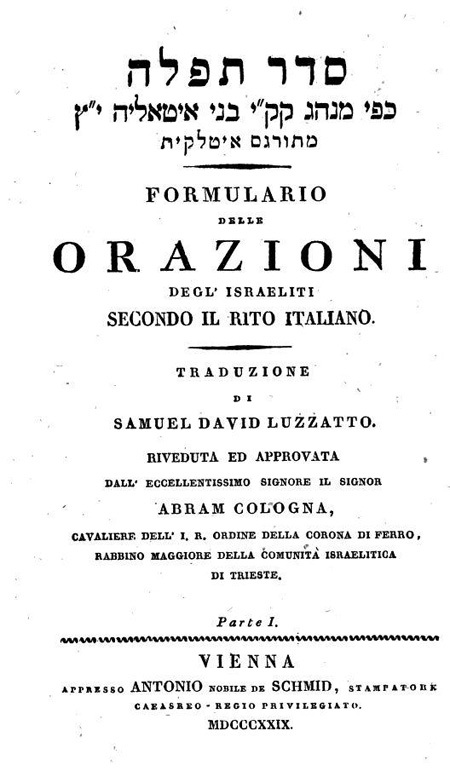 Some scholar of the Haskalah might think it is a good idea to compare and contrast these two versions; much material is lacking in the Italian, possibly because Romanin wanted to keep things shorter, or possibly that he wanted to keep things ortodosso. And in 75 years from now, someone can compare and contrast this post and my earlier one, on the two versions of these books, and submit a learned paragraph to some journal. "He was expert in Talmud and poskim, and all of them according to straight reasoning and true pshat. I heard from those who said he was also expert in astronomy books, Moreh Nevuchim, Kuzari, Ikkarim, Akedat Yitzchak, Chovot Halevavot, until he knew them word for word, and he followed in their example to explain the Bible and sections of Talmud and Midrash according to the method of rigorous investigation. He also had a hand in the Zohar and other kabbalistic books. 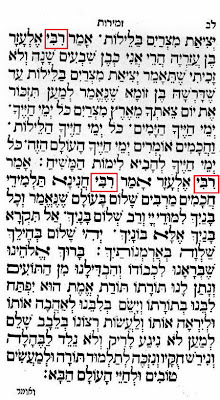 A reliable person told me that he heard from R. Judah Leib Ben Zeev z"l that one time he came to visit the Rav Hagaon zt"l and discovered that he was also an expert in Hebrew grammar books, and he knew his Talmud Leshon Ivri cover to cover . . . "
 He writes this in 1824. In the German version of the book which I linked to above, it is the seventh edition, printed in 1827. So five or six editions must have already existed at the time that the Italian translation was produced.